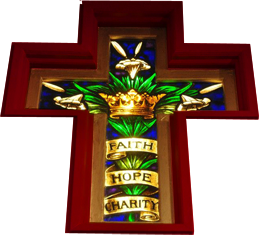 Haven Evangelical Lutheran Church is a community of believers, compelled and empowered by the Holy Spirit to share Christ's love for all people, with all people. We affirm with the apostle Paul that in Christ "there is neither Jew nor Greek, there is neither slave nor free, there is neither male nor female" - Galatians 3:28. Christ has made us one. Moving beyond the common distinctions of race, national origin, age, gender, physical/mental/emotional condition or capacity, political affiliation, marital status, economic situation and sexual orientation; we seek to "Welcome and encourage all people who seek the promise and grace of our savior Jesus Christ to participate fully in the sacraments of the Church and the ministries of this congregation." Three conscientious laymen met under a large oak tree in 1898 and discussed the need for a community church in the Chestnut Hill area. The idea came to fruition August 13, 1899 with the organization of Mount Zion Lutheran Church. Twenty-six members were present, and they met in a little frame school house. The first church, a white frame building, was built in 1901, and the name was changed to Ebenezer Lutheran Church. Our present brick structure was built in 1919 - 1920, and it assumed its present name - Haven Lutheran Church. Members struggled with their indebtedness, but paid off all debts long before they were due. Outstanding events during the 114 years of Haven's history have been the addition of Sunday School space in 1937, the contribution of $40,000.00 for a pipe organ in 1944, Haven's winning baseball team, Roy Simmons serving 50 years as music director, organization of the hand bell choir in 1976, the sponsoring of the Siharath family from Laos, building of the fellowship hall and kitchen during the 1980s, and many, many more. A memorable event was the year-long celebration of Haven's centennial in 1999. A centennial hymn was written by our minister Reverend Ronal Fink entitled "Join with us in Celebration". A history of the church, "Keepers of the Faith", was written by Mary Spires and a copy distributed to each member. Haven has enjoyed the service of twenty-one pastors and during the 1930's and 1940's the congregation swelled to 500 worshippers. Our beautiful sanctuary becomes a sight to behold at the Easter and Christmas seasons. © 2016 Haven Evangelical Lutheran Church Salisbury, NC. All rights reserved. Design, development, and photography by John Blake.